Date palm waste–derived biochar (DBC) was produced through pyrolysis (600 °C) and modified with zeolite (Z-DBC), silica (S-DBC), or nano-zerovalent iron (nZVI-DBC) to design efficient sorbents. The pristine and engineered biochars were characterized by SEM, XRD, BET, TGA, CHNS-O, and FTIR to investigate the surface, structural, and mineralogical composition. 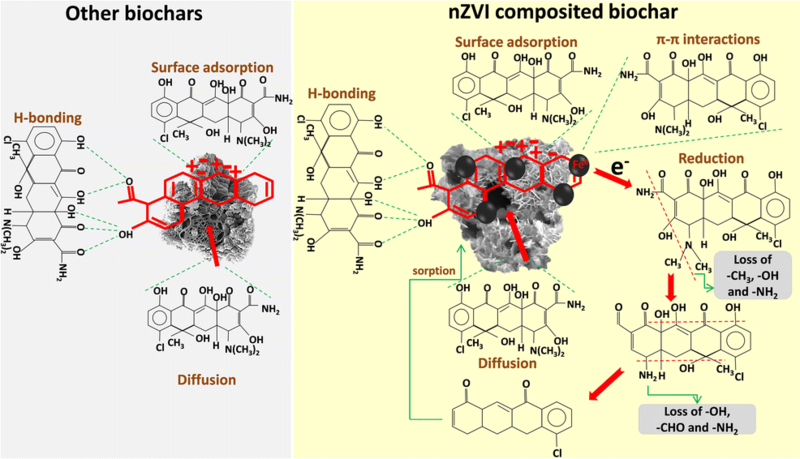 The nZVI-DBC exhibited lowest pH (6.15) and highest surface area (220.92 m2 g−1), carbon (80.55%), nitrogen (3.78%), and hydrogen (11.09%) contents compared with other biochars. Isotherm sorption data for chlortetracycline (CTC) removal from aqueous solutions was described well by Langmuir and Redlich–Peterson isotherms showing the highest fitness (R2 values in the range of 0.88–0.98 and 0.88–0.99, respectively). Langmuir predicted maximum CTC adsorption capacity was in order of nZVI-DBC (89.05 mg g−1) > S-DBC (45.57 mg g−1) > Z-DBC (30.42 mg g−1) > DBC (28.19 mg g−1). Kinetics adsorption data was best described by power function model (R2 = 0.93–0.99), followed by interaparticle diffusion (R2 = 0.85–0.96) model. The nZVI-DBC performed outclass by removing 98% of CTC, followed by S-DBC (68%), Z-DBC (35%), and DBC (36%). Chemisorption, H-bonding, and interaparticle diffusion were the operating mechanisms for CTC adsorption onto DBC, S-DBC, and Z-DBC, while π-π electron donor–accepter interactions and redox reactions augmented these mechanisms for highest CTC adsorption onto nZVI-DBC. Therefore, nZVI-DBC may serve as an efficient green technology for the removal of CTC from aqueous solutions and to reduce surface date palm waste pollution. • Magnetic and organo-mineral biochar composites were engineered and characterized. • nZVI-DBC has shown highest surface area and lowest pH among all biochar composites. 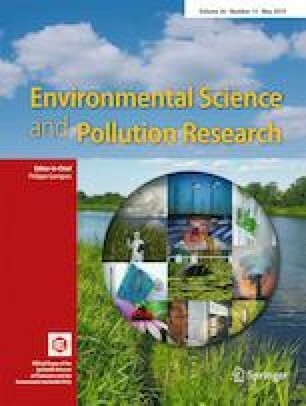 • nZVI-DBC exhibited three times more chlortetracycline removal than pristine biochar. • Chemisorption, physisorption, and diffusion were sorption controlling mechanisms. • π-π interactions and redox reactions augmented chlortetracycline sorption in nZVI-DBC. The online version of this article ( https://doi.org/10.1007/s11356-019-04850-7) contains supplementary material, which is available to authorized users. This work was funded by the Dean of Scientific Research at King Saud University through research group no. RG-1439-043.